Thom Fitzgerald paints a striking portrait of what may be the ultimate dysfunctional Canadian family. Nova Scotian family to be precise. In a directorial debut acheivement of stunning ability The Hanging Garden crosses time to capture the growing up of one Sweet William. Ten years after he disappeared from his family’s life, Sweet William returns home in time for his sister’s wedding. Despite the fact that he`s gone from a morbidly obese adolescent to a thin, handsome, self-assured young man, the reunion proves bittersweet. Although he reconnects with his loving sister and his grandmother Grace who now has Alzheimer`s, he is dismayed to learn that his parents’ rocky marriage has settled into endless animosity. He also witnesses the toll his absence has taken on his abusive, alcoholic father, Whiskey Mack; his tight-lipped mother Iris; and Violet, the tomboyish younger sister that he meets for the first time. But that is today. The past looms large in this film and we are witness to visions of Sweet William as both a waifish boy, played by Ian Parsons, and a fat adolescent, played by Troy Veinotte. And it`s not just the ghosts who dredge up the past. Rosemary`s new husband flirts shamelessly with William, bringing back memories of the painful relationship the two shared as teenagers. When Iris disappears, William must confront not only the haunting visions of his past, but also the unfinished business he left behind. 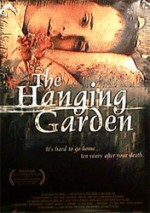 Nominated for more than 30 awards, The Hanging Garden or its Director, Thom Fitzgerald won 18 awards including the Claude Jutra Award for Fitzgerald and Best Canadian Film at the Atlantic Film Festival and Toronto International Film Festival.